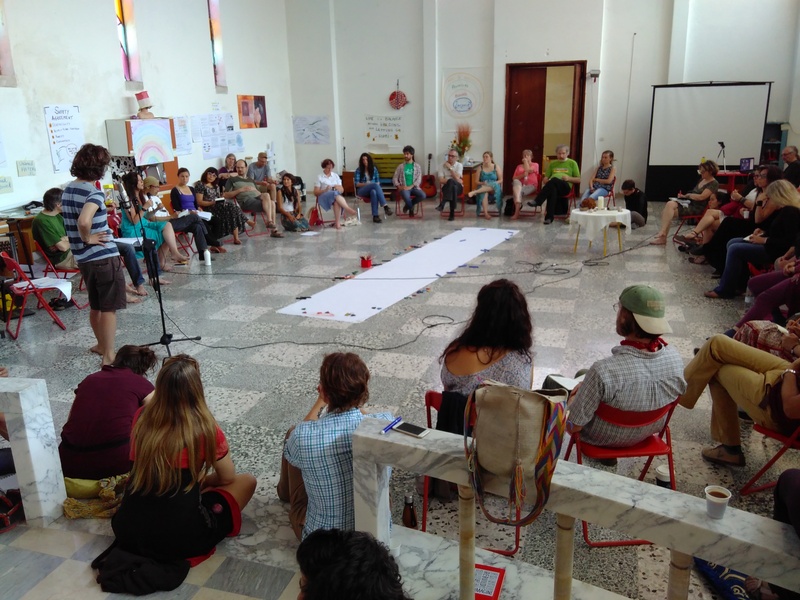 The Transition Hubs Gathering in Santorso, Italy. Villa Rossi, home to the Transition Hubs gathering. Hubsters having lunch in the shade. A selection of Santorso in Transizione’s posters. How those unable to attend were able to still take part in the Hubs gathering. Assembled Transitioners and local Santorso residents preparing for the evening’s festivities. Dancing in the square in Santorso. Photo: Sarah McAdam. The courtyard at Villa Rossi. Introducing the morning’s Open Space session. The Open Space session I attended, led by Ana Huertas, who gave an overview of the Municipalities in Transition work. In the evening we were joined by a group of 3 improv actors/facilitators from Bologna, who led us through a series of increasingly silly activities before getting us into groups to prepare short sketches, which were then performed in front of everyone else. It all ended with group singing, dancing, and daft nonsense. Very entertaining. On Sunday morning, Josue Dusoulier of the Belgian Hub, and I decided to climb the big hill behind Santorso. Well, a bit more than a hill, but not really a mountain, it is a 1km climb from the village to the top. The father of Ilaria, our host, told us that he, in his mid 60s, runs to the top in an hour and 5 minutes! Good Lord. At the top. Clue: I’m the sweaty one looking like a tomato. Great workshop on Transition in South America. This Hub creativity is very heart warming and that makes it news worthy! Thank you Transition for turning up the heat, softening and brightening the colors of global community.